See any of the custom built homes of Wind River Builders, and you can really appreciate the care and quality that goes into our work. We build true custom homes, down to the last detail, ensuring that our clients will feel comfortable in their newly constructed homes in the Scenic Northwest and the Columbia Gorge. Located in the Gorge, Wind River Builders tends to every aspect of home construction – we make our own trim and mouldings for doors and windows, balcony rails and stairways, as well as tend to fine inlay work. 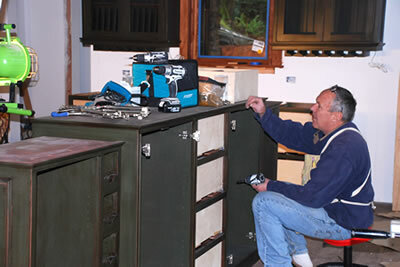 We offer custom cabinetry for kitchens, bathrooms and entertainment systems. We can create the fine finishing touches for your Gorge home, enhancing it with our beautifully crafted, custom furniture pieces. Whether you need an eating nook, book cases, desks, show cases, buffets, beds or hutches, we’ll create the perfect solutions for your living space. To truly understand our craftsmanship and eye for detail, please contact us to inquire about any of our Gorge building projects. We can help you plan every aspect of your new home, from the initial conceptual phases to the final finishing touches. If you are looking for craftsmanship, you’ll love our style. No two people are alike...so why should any two houses be alike? We work hand-in-hand with clients to create the fine details that make each home unique.